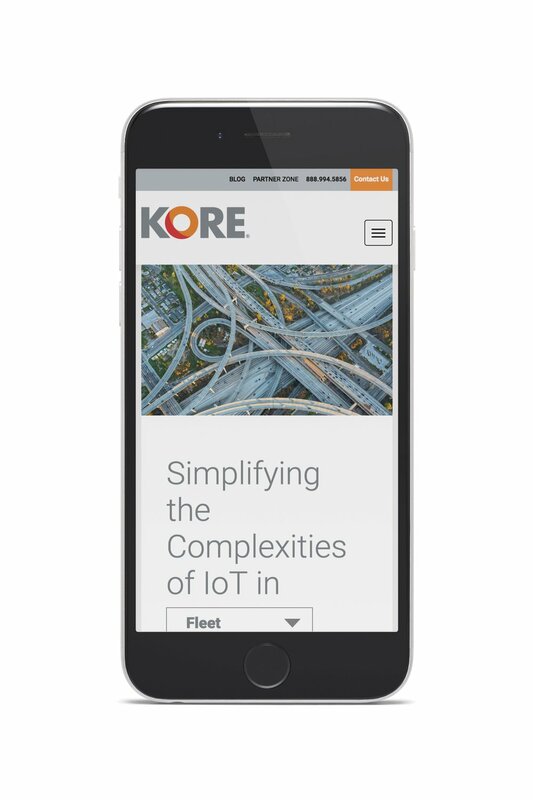 KORE, an Internet of Things provider, was going through a company reckoning. They had gone through an extensive brand audit and decided they needed to change their company purpose. Their new goal was to “Simplify the Complexities of IoT.” With this new purpose came a new logo, new brand identity, new applications, new website, new anthem video, all for a September launch at a global tradeshow. Easy Peasy. Our timeline was quite tight so we were building the plane as it went down the runway. There wasn’t time to get a brand guideline approved before designing collateral or framing out the website. So it was all done in tandem. We worked with Sue Hollub, the CMO at KORE to ensure that each step we were making was the right one, to avoid time intensive mis-steps. I worked closely with Sue on the brand guidelines, colors in particular were very important to her, as well as the anthem video, which I directed and edited. We had a team at Realm working on the website, which we launched in 4 languages a few days before the public launch at the tradeshow.